Congratulations on finally having that annoying tree of yours removed. You now have an open yard free from the obstructions of that old tree you once had. But wait, you can’t celebrate just yet. Sure the significant portion of your tree is gone, but what about its tree stump? It’s still there if you haven’t noticed. You may want to hire stump removal services to remove it and finally say that you’ve fully gotten rid of your tree. A potential tripping hazard – most neglected stumps will grow shrubs and moulds which would entirely hide it from the naked eye. Most people who wander through your yard might trip on it as it can be hard to notice once it’s fully covered in green moss. A home for pests – dead stumps can become home to termites, mole crickets, and several other pests that can devastate your entire lawn. If can also become a shelter for dangerous wild animals like snakes, racoons, and stray cats. A Leech – Even on its own, a fresh stump can continue leeching the nutrients that are supposed to be for your other plants. What’s worse is that if you don’t remove your stump, it can potentially re-grow your tree, which defeats the purpose of having it removed in the first place. Steals space – stumps can potentially take up some precious space from your yard. You could place a new feature to replace your tree had you considered removing your stump and get the job done. But you didn’t so you’re left with the remains of what was once your old tree, and you’re still having the same problems. Stump removal is expensive. But the costs should not overshadow the potential dangers that a tree stump can bring to you and your family if you leave it behind. 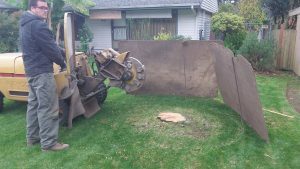 Get the job done and have your stump removed once and for all so you can start experiencing the benefits of finally having your tree removed along with its stump.